HELP! I'm in Portland - last minute trip. I'm overwhelmed with choices - don't want to waste the few days I'm here - would love recommendations on restraunts and beer/wine/cocktail bars!! Thanks!! One word: Kenny & Zukes. stevez wrote: One word: Kenny & Zukes. In addition Kenny & Zuke's (which I believe is actually 3 words ), I'd also recommend Toro Bravo. Back in the 70s and 80s, I never missed a visit to Jake's Framous Crawfish whenever I was in Portland, which was often enough. In addition to wonderful seafood, they had a killer list of Oregon wines. Well. Jake's has since morphed (again and again) into McCormick and Schmick's, which, even in KC, gives pretty damn good seafood. 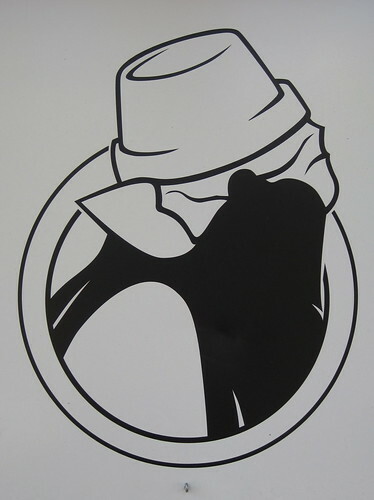 But I haven't a clue about what the original Jake's is like, whether it resembles its past form or not. But: if it does, it would be well worth a visit. I'll leave that call to folks familiar with its present incarnation. Sooo, you like wine and are looking for something good to read? Maybe *this* will do the trick! Check out extramsg.com for all things Portland food related. He's been busy so it's not real up to date but it's excellent. Here's one of my favorites that he (extramsg) took me to. Excellent Ramen w/Korabuta pork belly (I usually get extra pork belly). The kimchee and freshly made cold tofu are outstanding as well. "In pursuit of joys untasted"
I totally agree on Kenny & Zuke's, Biwa. Bacalao, arancini, Scallops with peach, Clams, Bibb salad, Braised short ribs, Brined pork chop, Fra diavolo (usually as last resort), Bread pudding. Also check out the cocktail concoctions. Loved burning/choking on the horseradish vodka. This is a Cantonese home-cooking style restaurant in Chinatown. Pass if you expect fine cuisine and high-end ambience. This is a Cantonese noodle and BBQ shop. Order accordingly. Tiny place but loved the experience. Think the chef used to be at Pok Pok. Defintely Biwa. Love that place. Tanuki and Toro Bravo are excellent as well. Dan and Louis Oyster Bar is a totally old school (est. 1907) Portland landmark. It is sort of like Portland's version of the old Berghoff, except with shellfish. 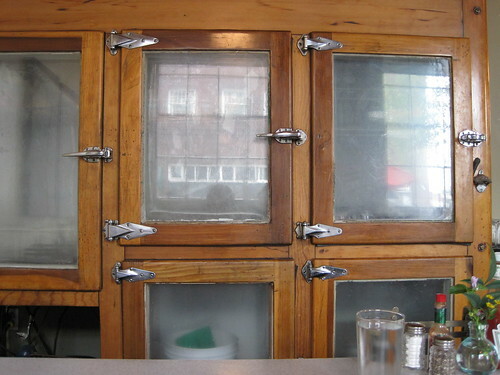 They are famous for their Oyster Stew, which I haven't had in many years, but remember quite fondly. I imagine it hasn't changed much. The actual bar has good happy hour deals on fresh PNW oysters and serves Deschutes Mirror Pond Pale Ale on tap (along with some other local brews). All very Portland-esque and fantastic. I would recommend Ken's Artisan Bakery for breakfast. Everything is baked fresh each morning and throughout the day and it is relatively cheap. There are also some fancier grocery/markets nearby where you can get some fresh fruit to accompany the baked goods. The NY times just had an article about a place serving Thai bar food. Kind of makes me want to jump on a plane to Portland. 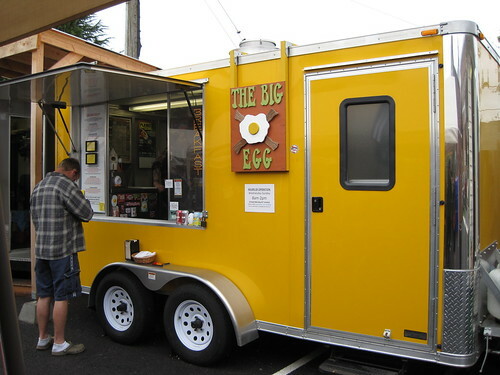 no visit to Portland is complete without checking out their diverse food cart scene. they literally have hundreds... there are a few parking lot areas where you'll find 30 of them next to one another. 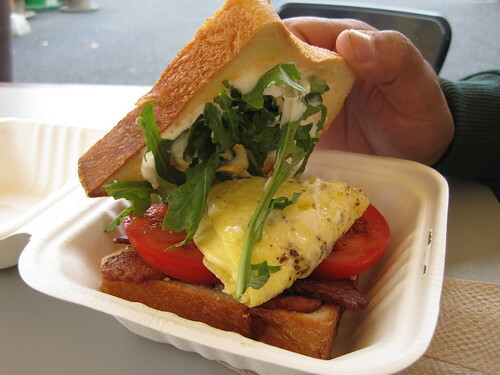 high on my list last time was Addy's Sandwich bar, where you can get among other choices a duck confit sandwich for $5. ...unfortunately they ran out of everything by the time i got there last visit. .. arrive early I guess. 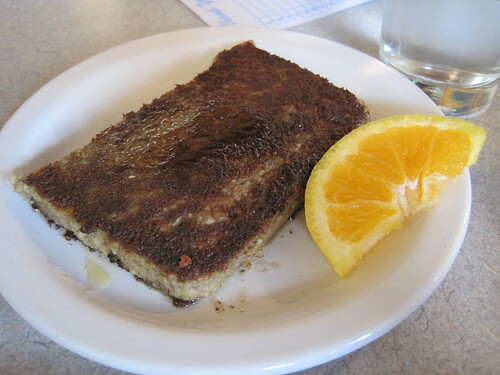 http://www.oregonlive.com/dining/index. ... carts.html is a recent article w/ other mentions, but there are a few other good choices that article missed. Like the Seattle solo thread, I'm bumping this thread to see if there's anything new I should know before a first, week-long visit to Portland next month. I'll be with friends who are adventurous eaters and getting around ideally only by bike. Price range is flexible, and more casual places are preferred. Thanks. happy_stomach wrote: Like the Seattle solo thread, I'm bumping this thread to see if there's anything new I should know before a first, week-long visit to Portland next month. I'll be with friends who are adventurous eaters and getting around ideally only by bike. Price range is flexible, and more casual places are preferred. Thanks. Thanks for prompting me to finally report on some Portland meals . 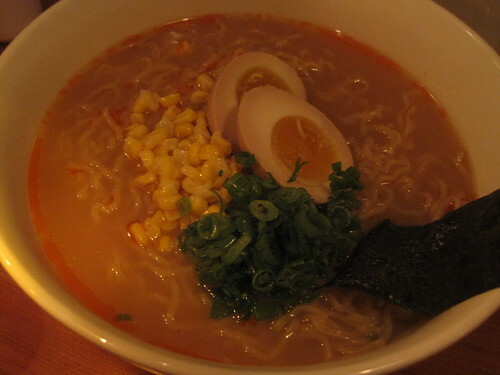 . .
Our favorite casual meal in Portland last fall was at Tanuki. It's a fun Japanese spot, that's really only sorta Japanese. The "splurge" option on the menu was $25, but you could spend a lot less as were were hungry and it was still way too much food. Highlights included oysters with kimchee shave ice, local albacore with abalone mushrooms in a cinnamon tea sauce, fresh water eel skewers with preserved daikon, and mussels in a spicy pork sauce. 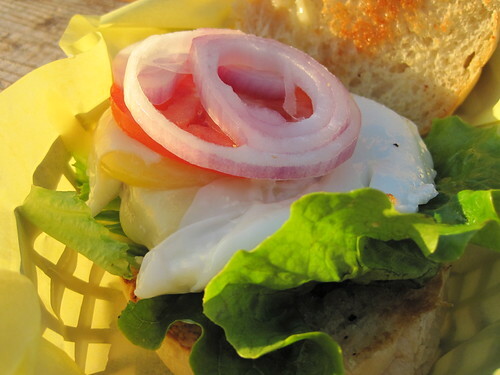 Loved Bunk Sandwiches. Really casual spot, great food, everything made to order. 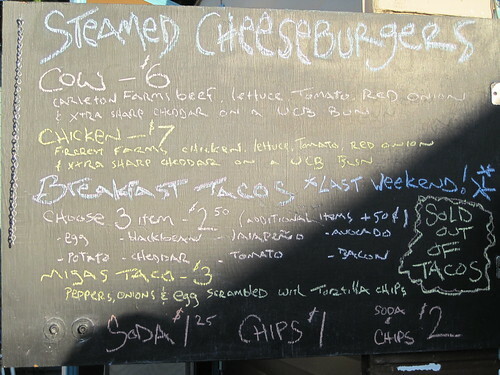 Ten01 is great if you're hungry early and on a budget (Portland has amazing happy hour deals). It's not fancy, but I wouldn't show up in less than jeans and a stylish tee. In addition to $1 oysters and $3 drafts of quality beer, we had a chorizo burger ($7) and a charcuterie platter with pistachio apricot pate, fra mani salami, pickled shallots, and prosciutto ($7). Kenny and Zukes, of course, for great pastrami, pickles, etc. Clyde Common was also solid, and right around the corner from K&Z. We enjoyed a flatbread with eggplant and ricotta, a burger, and fries with harissa creme fraiche. Le Pigeon is a dark and cozy, thoughtful, delicious French restaurant. Perhaps fancier than what you're seeking. Highlights were the bone marrow with roasted garlic and salsa verde, a lamb neck and chanterelles dish, and beef cheeks bourgignon. Sahagun chocolate for great hot chocolate and espresso sodas. 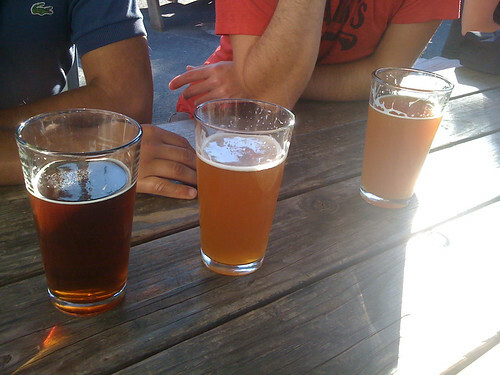 Bridgeport Brewery and Lucky Labrador were both fun local microbreweries. I wouldn't say that either are worth going out of your way for, but both had decent beer. And, of course, countless food trucks. We enjoyed Koi Fusion - - spicy pork and beef bulgogi tacos. 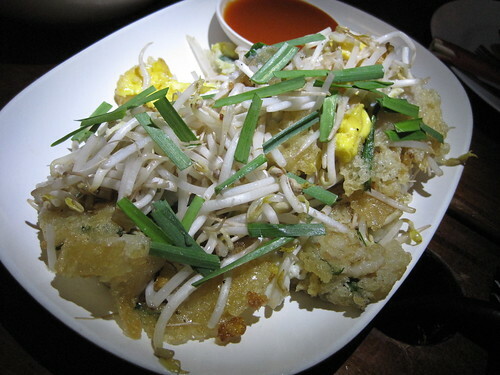 thaiobsessed wrote: The NY times just had an article about a place serving Thai bar food. Kind of makes me want to jump on a plane to Portland. 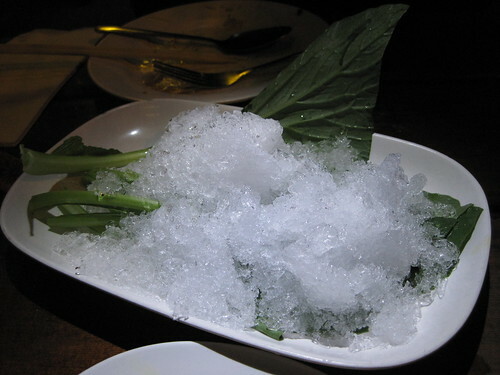 We loved Pok Pok, referenced in this article above. I wouldn't call Le Pigeon fancy, and enjoyed it a lot every time we've been. The first time we went to Clyde Common we were far more impressed than the second time we went (half the things on the menu were sold out, they had boatloads of empty tables but made us go away for 15 mins, then made us wait another 15 mins to be seated). Sympatica for both Sunday breakfast and their family dinners were great. 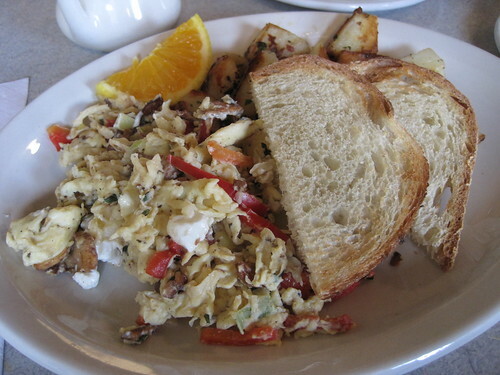 We like Kenny and Zuke's for breakfast, as well as Bijoux Cafe and Mother's. ps - there are a few other Portland, OR threads to check out. but it CHANGES THE WORLD for that one dog. 1) Sahagun has closed. Elizabeth has decided she can be a lot happier selling wholesale only. 2) Ten-01 now has two menus, their regular upscale menu, and their downstairs small plates menu, where just about everything is $10 or under. The downstairs menu is always available downstairs. I believe they still have a happy hour, too. 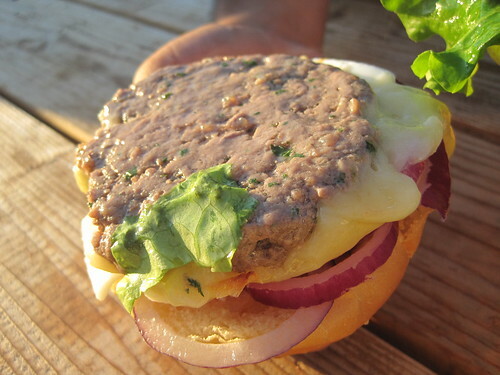 3) Bunk now has a second location, Bunk Bar, which has their sandwiches, plus fries and booze. 4) Leek, your description of what happened at Clyde doesn't really make sense. Did you go there early? They only offer a bar/happy hour menu until 6pm. 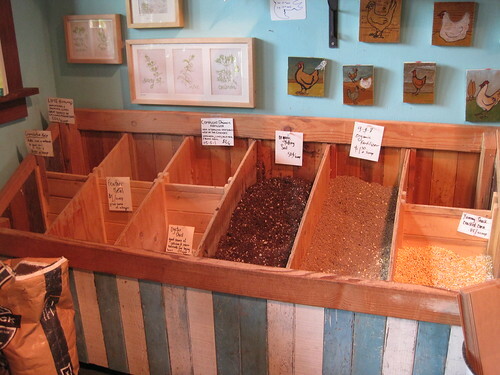 5) You would be served well by a post at PortlandFood.org or at least a perusal there. 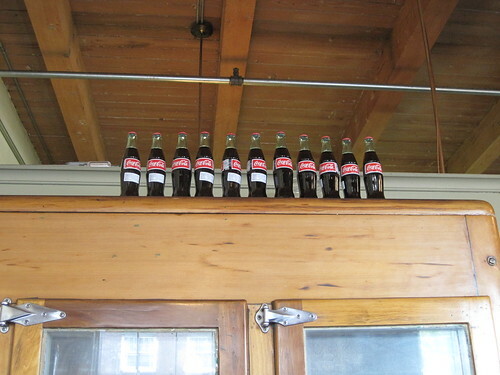 This "visiting Portland" thread is a good start. Also, this downtown dining guide I put together for IACP is a good primer. we went to Clyde Common on the later side - 9 pm or so. Following a stop-over in Seattle, I recently visited Portland for the first time. My goals were to spend time with an old friend, bike and eat--all of which I did with gusto and, I think, reasonable success. 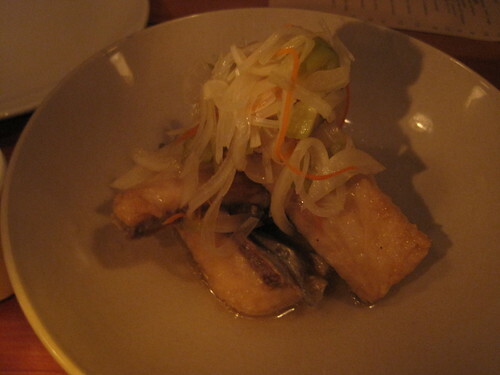 My first stop was late-night snacks at Biwa. 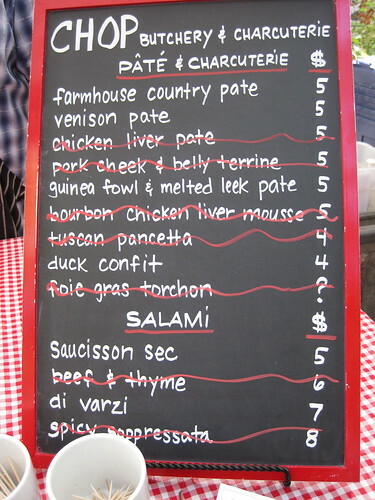 I loved the small plates here. 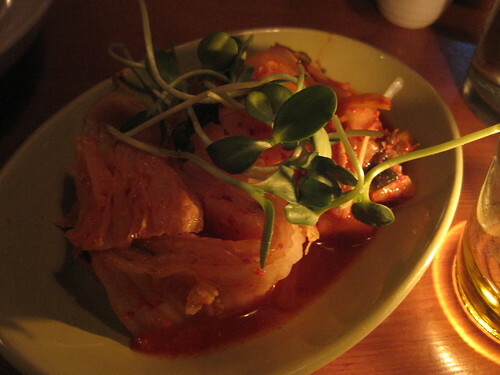 We ordered kimchi, the “barbarian-style” pickled mackerel, the grilled shiitake mushrooms and the ramen with corn. Biwa had sake specials in honor of International Sake Day, so we also ordered some Kasumi Tsuru Kimoto Extra Dry, which was ideal for our food. 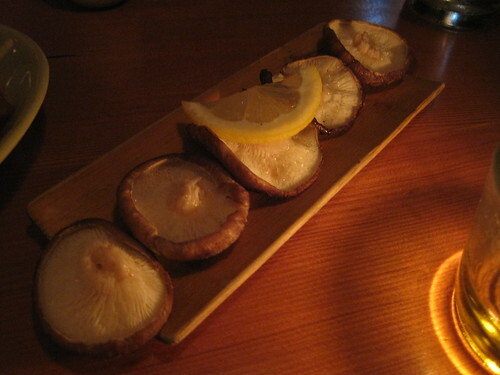 My favorite dishes were the pucker-perfect mackerel and soothing shiitakes. Before we ordered, the server explained that the ramen broth recently changed. Biwa now offers only a single broth, which we were told is like a combination of shoyu and chicken. I found it odd and not especially tasty. 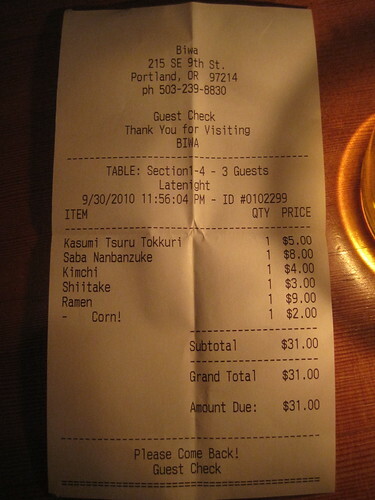 The corn was worth adding to our ramen if just for the bold line item on our bill. A late night resulted in a late morning, but before we set out, I had a cuppa from my friends’ impressive collection of Jasmine Pearl teas. 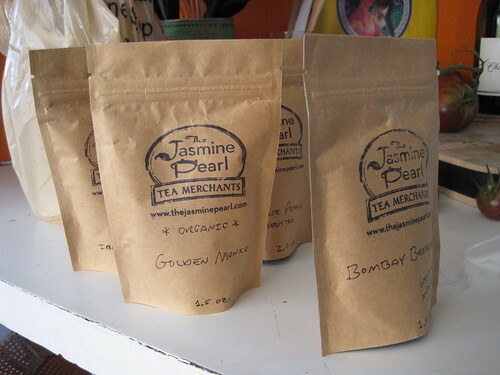 My favorites from the Portland-based tea merchant were the Bombay Breakfast, a black tea with traces of cardamom and ginger, and the Golden Monkey, another sweeter black tea. My hosts in Portland live on Mississippi Avenue, a hip and happening thoroughfare northeast of downtown resplendent with good to excellent food. We walked the main section of Mississippi on my first morning in Portland. My friend suggested The Big Egg for breakfast. The food here made me seriously reconsider my long-standing aversion to having my first meal of the day outside my home. It reminded me that cooking eggs takes skill that most of the brunch places I’ve visited in my life do not have. I ordered a scramble with Fontina and finely diced red potatoes and bacon. 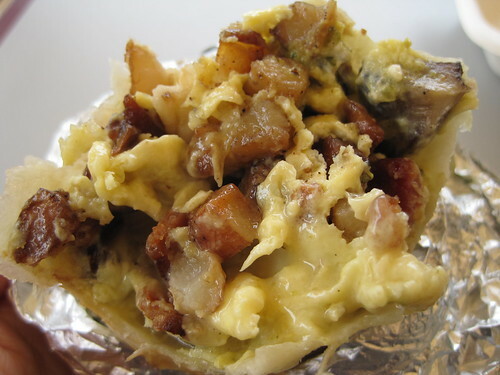 It doesn’t sound special, but all of the ingredients were top-notch and the eggs incredibly voluminous and silky. I also had some of the tomato in my friend’s breakfast sandwich. 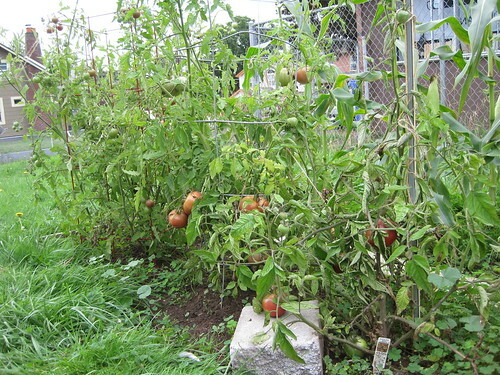 The best tomatoes I’ve had this year were on this trip to Portland, The Big Egg’s and harvest from my hosts’ garden included. From The Big Egg, we continued down Mississippi. The range of food options made me giddy. Moxie Rx, a “roadside juice bar and cafe,” was closed for vacation, but we stopped to admire the green performance space at the back of their lot and their child-sized picnic tables. 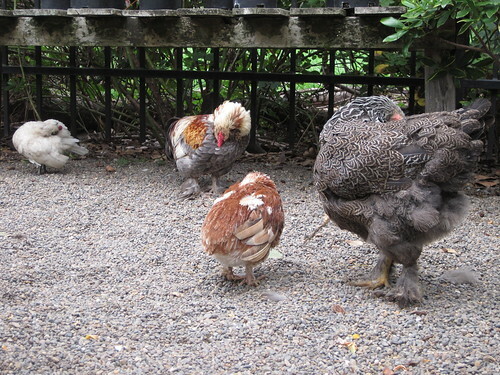 Next, we visited Pistils Nursery, a marvelous source for all kinds of plant life, chickens and feed. 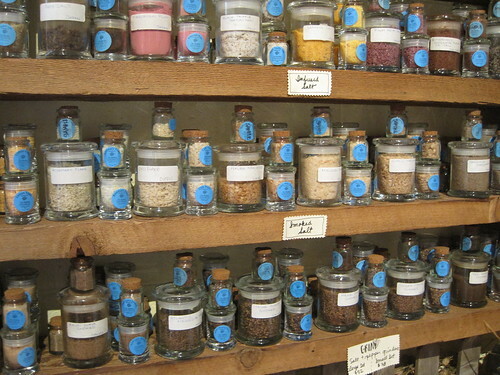 The Meadow, a salt, chocolate and wine shop, was our next stop. 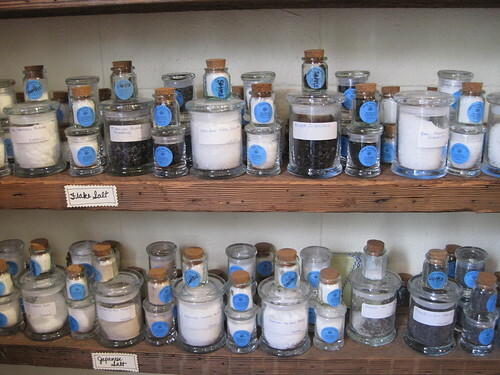 With probably somewhere near 150 specimens to sample, I had never seen such an extensive collection of salt. As we were browsing, we got some guidance from a gentleman working in the store. He then stepped out, but I mentioned to the woman at the register that The Meadow reminded me of a salt expert I follow on Twiitter, @selmelier. She informed me that the man who had helped us was none other than Mark Bitterman himself, and that we were in his shop! That coincidence made my morning. 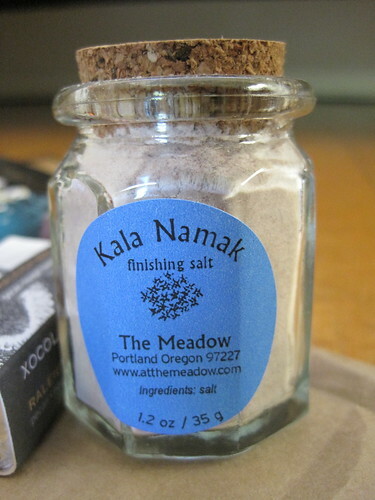 I purchased a small bottle of the most unusual salt I tasted: Kala Namak, a high-mineral, pungent pink salt. Recently, Fox & Obel’s chocolate selection has grown to impressive proportions, but it’s got nothing on the wall of chocolate at The Meadow. I picked up a selection of the house salted chocolates but also bars from local chocolate makers Xocolatl de Davíd (the pecan-nougat-bacon caramel bar) and Sahagún (which recently closed its retail shop to focus on wholesale; I got a dark chocolate bar with dried corn kernels). 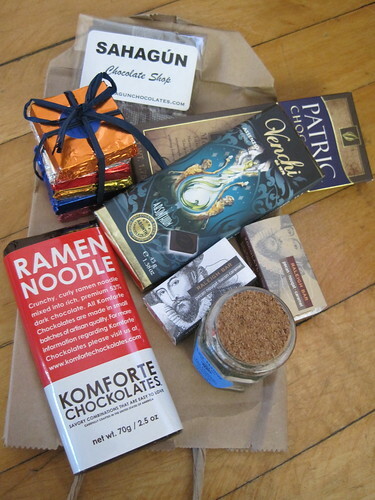 And I bought two novelty chocolates from outside Portland, including a ramen noodle and (separate) absinthe bar. Unsurprising, we were parched after our visit to The Meadow and stopped at taqueria Por que No for drinks. 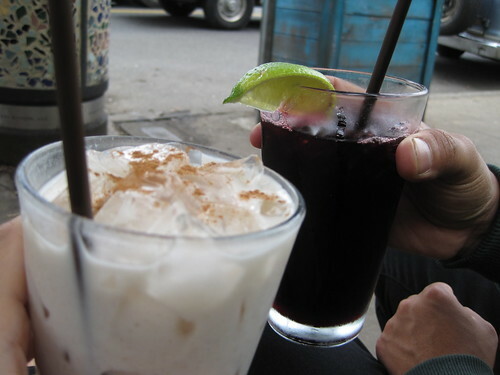 My friend recommended the Horchata Borracha, which was basically a tall glass of undiluted rum disguised as horchata. He said my drink was unusually strong; I couldn’t detect any rice or almond or even the cinnamon I could see sprinkled on top. It got better as the ice melted. Friend had an agua de jamaica. In contrast to its regal, inky hue, this drink was very refreshing with a subtle sweetness. Not quite borrachos, next my friend and I got on our bikes to visit one of his old hang-outs, Crema Café in southeast Portland. I only tasted the raspberry frosting of his lemon-poppy seed cupcake. 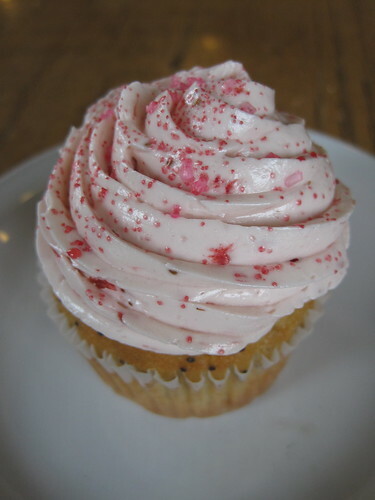 I could discern the raspberry, but the consistency of the frosting was lighter than I usually prefer. 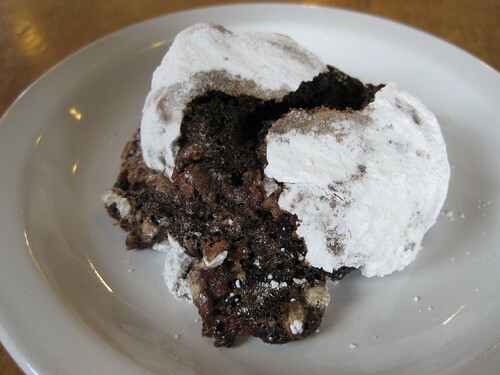 The Earthquake cookie was a simple and satisfying dark chocolate-powdered sugar confection. After Crema, we got on our bikes to visit Movie Madness, which has got to be one of the best video stores in existence. 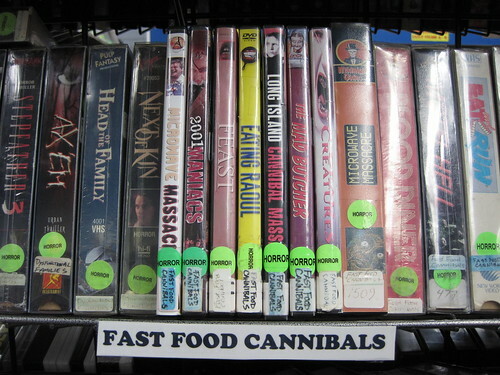 I was only there for a few minutes, but my guess is that it would be a reliable place from which to borrow all manner of foodie films. 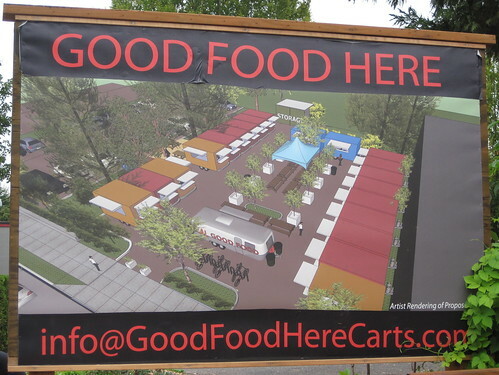 Heralded by a billboard, my friend and I then spent a few minutes checking out the new food cart pod near Movie Madness. Lardo looked especially promising, but we didn’t have time to eat. Happy hour called. 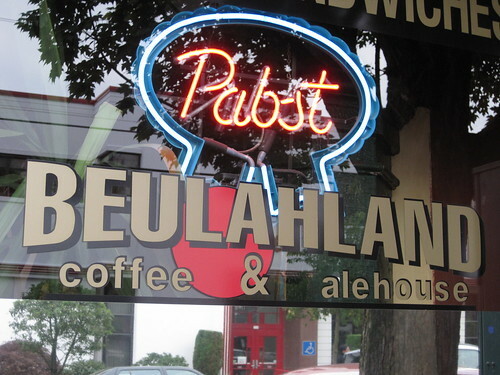 Fans of their infused whiskeys, friends and I biked north to Beulahland, a really comfortable, spacious dive with the extra draw of a full case of pies. 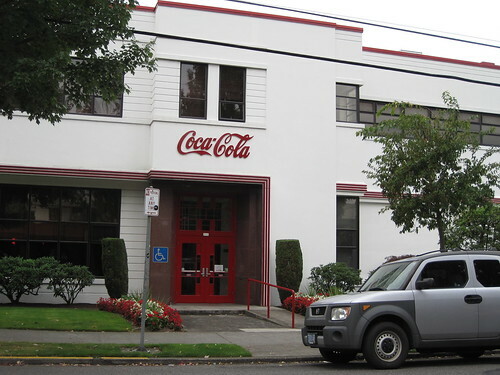 Beulahland is also worth visiting to spy the handsome Art Deco building occupied by Coca-Cola across the street. 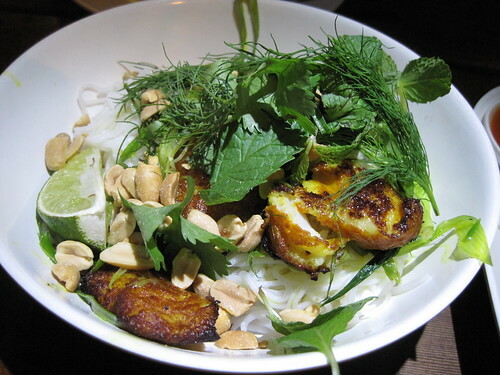 We lingered at happy hour, and then biked to Pok Pok for dinner. At around 7:00pm, we were quoted a wait of two and a half hours. We were desperately hungry for Thai and considered getting our dinner to go, but only a fraction of the menu is available for pick-up. After some brainstorming, we decided to order appetizers to eat across the street and then check again on the wait for a table. The lot across the way was a new food cart pod in the works, chained off and pitch-black, but we weren’t discouraged. 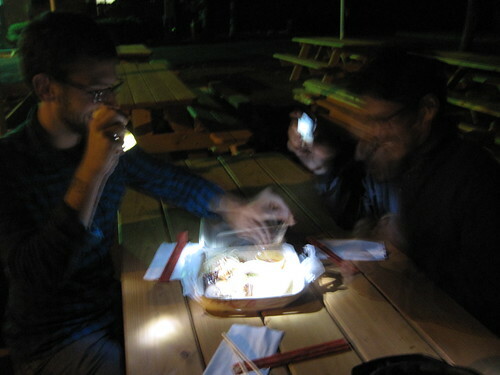 We feasted on our kai yaang and papaya salad on a newly-built picnic table by bike and cell phone lights. Even with the blur, I think smiles are visible. 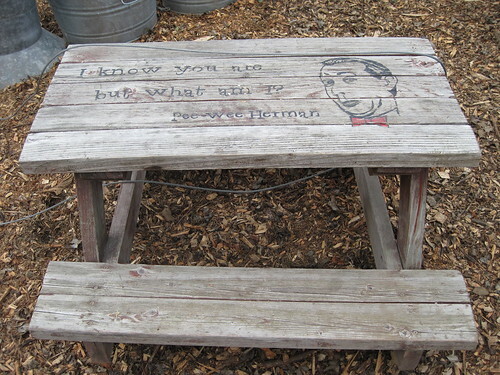 A lot of people must have been deterred by the quoted waits because our table was ready as soon as we finished our snack, about 40 minutes after we put in our name. To start, the mussel fritter was extremely greasy, the low point of our meal and probably all of my eating in Portland. I’ve already raved about the Cha Ca La Vong. 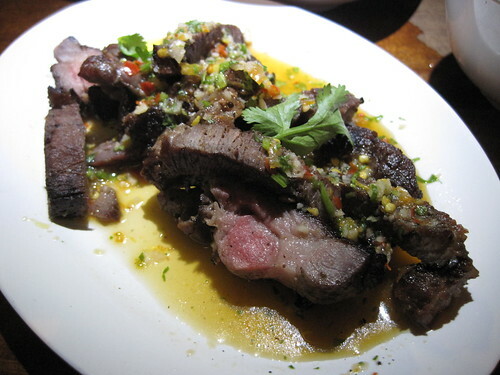 Muu paa kham waan--boar collar meat rubbed with garlic, coriander root and black pepper, glazed with soy and sugar, grilled over charcoal and served with chilled mustard greens and a spicy chili-lime-garlic sauce--was very excellent also, especially with heavy use of the chili-lime sauce. We also had at Pok Pok a tamarind drinking vinegar and cocktails, but I don’t remember the specifics. A winding, waterfront bike ride followed, which left me too tired for dessert at Pix Pâtisserie, where we stopped on the way home. The next day, we got an even later start and had our first meal of the day at Kenny & Zuke’s. I imagined crowds given the reputation of this place, so I was surprised that we were able to walk in and choose a table and eat among mostly--it seemed--locals. The spicing of the pastrami was almost too delicate for me, and I prefer much fattier deli meat in general, but I enjoyed our lunch. I hoped maybe to meet and thank extramsg but no luck. 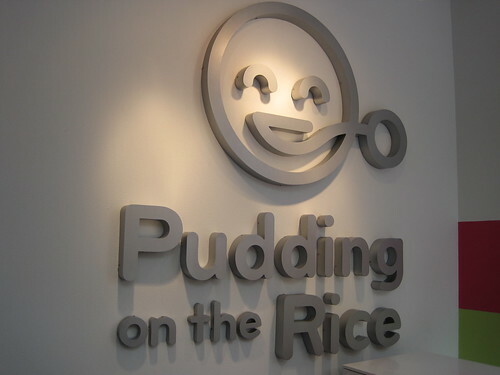 After Kenny & Zuke’s, we took a walk and happened on Pudding on the Rice, a bright and cheery rice pudding and crêpe bar. I could only taste cinnamon in the pumpkin pudding, but it made me want to experiment with rice pudding varieties at home. Unfortunately, this place stunk of blue cheese from crêpes. Portland State University (PSU) Farmers Market was next. We gorged on local walnuts and hazelnuts, last-day white peaches and blueberries, huckleberry jam, cheese, ciders, cookies and charcuterie. 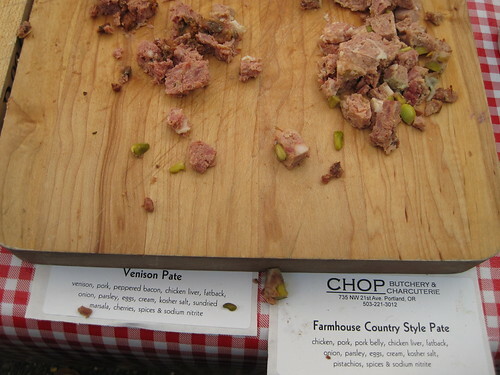 My favorite snacks were Chop’s venison pate and, as I’ve noted already, Two Tarts’ basil macarons. I was also delighted to come across the Alma Chocolate stall, where I bought a jar of habanero caramel sauce, which I want to eat straight from the jar and maybe also use in my oatmeal. 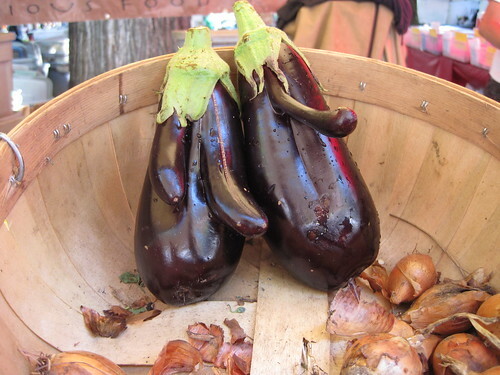 We matched aubergines before we left the market. 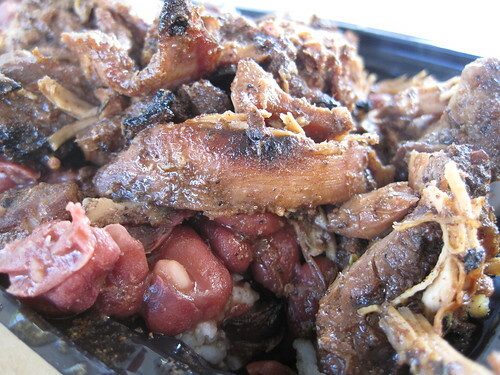 Next, we rode back up to Mississippi Ave. to meet a friend for drinks with a pit stop along the way for jerk chicken, red beans and rice at Caribbean Kookpot. The rice was extremely mushy, but the chicken was well-seasoned and off-set nicely by the beans. And I think the generous helping cost only $5. Ironically, drinks that followed at Amnesia Brewing were not memorable. But I may have been in a pastrami-rice pudding-cookie-jerk chicken daze. I recall the place having neighborhood charm. It was a short ride from Amnesia to Brown Chicken Brown Cow, and I can’t remember names of the streets we took, but the route culminated in an exhilarating downhill followed by a winding, steady climb that we took at a brisk clip. The hill wasn’t steep enough to get out of the saddle but rose enough to make my legs work and stimulate my appetite. Steamed cheeseburgers and a storybook sunset greeted us at the summit. The light color of the steamed patty made me think it might be bland, but the herbs contained therein made it surprisingly flavorful, especially with the red, mildly spicy, also herbaceous condiment available at the counter. Soft and somewhat slimy, the steamed burger reminded me of a nuked veggie burger, but the super fresh lettuce, ripe tomato, crunchy red onion and buttered and toasted bun basically remedied the texture. The steamed egg, however, which I wanted to be slippery, was overcooked and didn’t spread well. Both my friends were impressed with the supposedly extra sharp cheddar melted on the burgers, but I almost missed the cheese on mine--not sure why. I’m happy we tried Brown Chicken Brown Cow, but I much prefer the aroma, texture and taste of burgers cooked by more common means. If I’m ever in central Connecticut, I might swing by Ted’s. Maybe I’d be happier with a thicker steamed burger. In the same food cart pod, we also had sweet corn ice cream from Scoop. It wasn’t the smoothest ice cream I’ve ever had, and I would have preferred more pronounced corn, but it was a fine prelude to our next stop: Lovely’s Fifty-Fifty. I had spied the ice cream list at this place the first morning I walked Mississippi Ave., but the restaurant was closed then. We ordered the Salted Caramel, Malted Milk Ball and Cherry Noyaux, which were all very good. 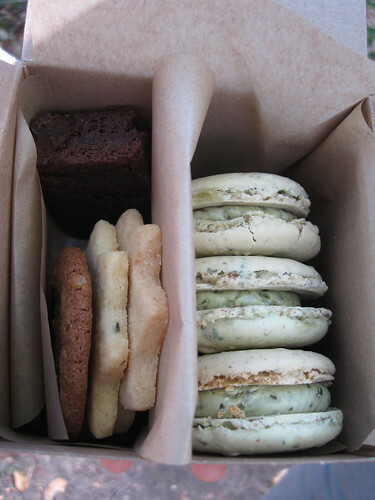 My favorite was the Salted Caramel, which was unabashedly salty. The consistency of the ice cream overall seemed more airy, like gelato, which meant that it was easy to eat a lot of it. I thought I was lucky to live two blocks from Black Dog Gelato in Chicago. It seemed like there were places like Black Dog all over Portland. During conversation over ice cream outside Fifty-Fifty, one of my friends mentioned Jan Švankmajer’s films Food and Conspirators of Pleasure, neither of which I had seen. It was about time for a break from eating and drinking, so we walked down the street to a video store and rented the DVD with both movies. 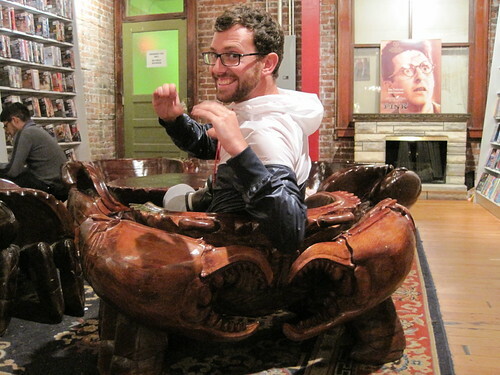 One day when I start an LTH thread on food furniture, I will reference Video Verite’s crab chairs and table. After our movie break, we made our way over to Clyde Common for cocktails. I had the Barrel-Aged Negroni--Beefeater gin, Cinzano Rosso vermouth, Campari, aged for two months in a Tuthilltown whiskey barrel and finished with orange peel--which I enjoyed despite and eventually because of the assertive orange. We had some other cocktails and amari, but I can’t remember the details. My friends also ordered snacks--figs with ricotta salata, mint and peach-thyme syrup and the fries with harissa and crème fraîche. 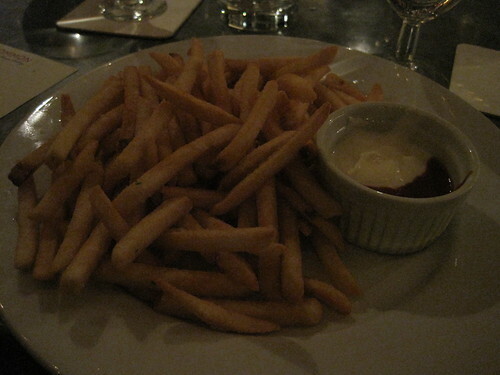 I skipped the figs, but the fries were crispy if otherwise generic. Harissa with crème fraîche is my new favorite dipping sauce. I would return to Clyde Common for $5 happy hour cocktails, but we had no interaction with the bartender, and I didn’t love the space. I found the bar too sprawling, and I generally don’t care for high ceilings in restaurants or bars. My taste buds were shot after Clyde Common. I swore I would never eat or drink again, but then we danced to Bollywood techno-punk for three hours, and I regained my sense of taste and was ready for another meal. We got to Montage at about 2:30am, and the place was packed. This was one of the most diverse scenes, with or without food, I’ve ever come upon. Boisterous hipsters, muscle t-shirts, suits, promsters, tourists and off-duty burlesque dancers shared the space and chowed on the restaurant’s eclectic fare. Add our waitress, who in appearance and demeanor seemed straight out of a Toulouse-Lautrec painting, and I felt like Alice in Wonderland in the most awesome way. We ate frog legs, hush puppies, jambalaya and butter cake--all of which were hearty, satisfying and priced very reasonably. I wrongly assumed this would be mediocre drinking food. 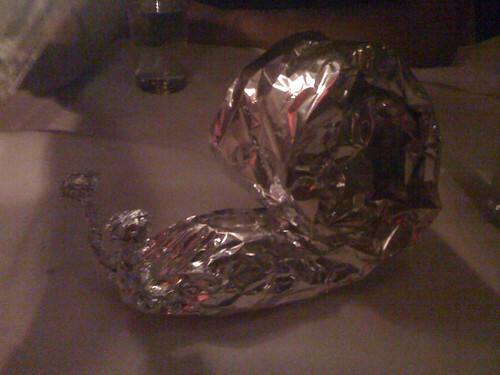 The only reason I didn’t finish my meal was so that I could get a foil sculpture to take home. During the course of our visit, the kitchen sent out to different tables a menagerie of packaged leftovers. I was happy with my jambalaya snail. Montage (and maybe everywhere in Portland?) stopped serving alcohol at possibly 1:00am, so I didn’t get to try any of their cocktails. On my last day in Portland, I only had time for one meal. We set out for Tasty n Sons, but we changed plans as soon as we spotted a line outside. J & M Cafe in Lower Burnside is one of my friend’s favorite brunch spots, and I’m glad we ended up there. It seemed much more relaxed and spacious than other places around town. I liked sitting at the counter, where we had a view of a neat cabinet refrigerator. My friend and I both ordered the special of three scrambled eggs with Cypress Grove goat cheese, leeks, red peppers, fresh oregano, chanterelles and home fries, which was as pretty and salubrious as it sounded. The food reminded me somewhat of Birchwood Kitchen, but the cooking at K&M was more sophisticated in a more diner-like setting. 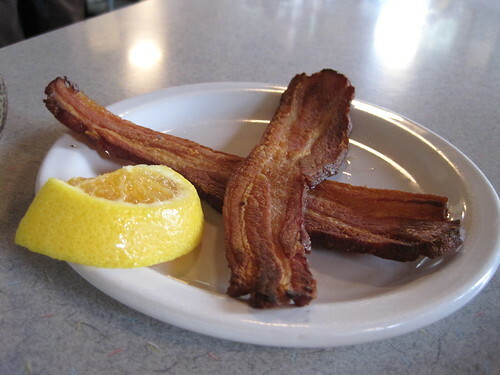 Friend liked his side of thick, crispy bacon, and the scrapple with a very thin maple glaze was just the funk I needed to round out my late breakfast and first visit to Portland. I read a lot about bikes and cities and therefore knew of Portland’s infrastructure, but I was unprepared for the implications of the biking culture for eating. First, I was hungry more often because I biked everywhere. And there are hills. Bike lanes and then plentiful and secure bike parking made getting in and out of restaurants extremely easy. Food carts were even more accessible, being situated outside and grouped in pods. The seemingly endless variety of inexpensive food and visible plans for new pods only further motivated me to get out and bike and eat. Portland is a glorious city, and my heart (if not also my belly) was heavy to leave. N. Mississippi Ave. & N. Fremont St.
Holy cow, happy_stomach, what a trip you had! Thanks for sharing -- both Portland and Seattle sounded great. Great post, H_S! I miss Portland and your post only makes me want to get back there sooner rather than later. This picture brought back a flood of memories. Not of Portland, but of the original Francis' Deli on Clark and Arlington, a regular stop from the time I was 3 until they closed (and opened as the faux Francis' Deli up the street). 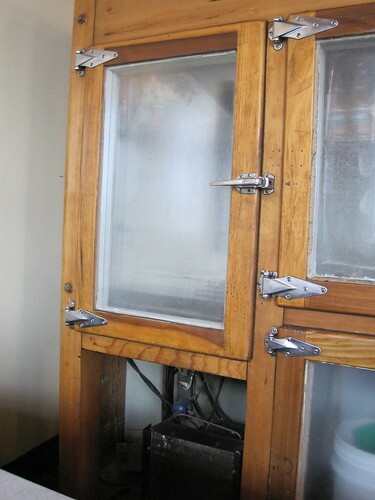 Do you know what this type of refrigerator is called? happy_stomach wrote: Do you know what this type of refrigerator is called? At Francis', I think they simply called it "The Cooler". I am glad you posted about Biha. I am visiting Portland in December and was trying to determine which place to dine at for ramen. After seeing Biha's picture, I am more inclined to try Yuzu or Takahashi instead. I am surprised you did not stop by Voodoo Donuts. Friends of mine who recently moved there are infatuated with the place. Biwa used to have quite a complex broth, apparently they've changed it. Another nice add on was the Korobuta pork belly for a couple bucks extra. Haven't been in a few yrs though. And the agedashi dofu (made in Portland) that they used was the best I've had outside of Japan. Francis'. Loved it. Preferred their steamtable over Bravermans. I thought I had mentioned this before but one of my favorite meals in Portland was at Podnah's BBQ. I don't remember exactly what we had (it's been a while) but I do remember that it was some of the best BBQ I've had in a long time. There must be another Portland thread floating around. Next time I make it back to Portland, I'd definitely hit this place at least twice. 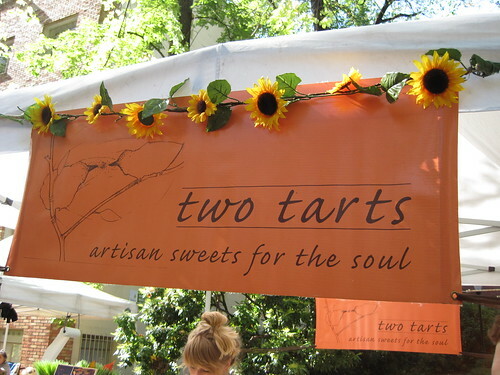 Jazzfood wrote: Portland's Farmers Market puts ours to shame. That's an understatement. What I loved in particular about the PSU Market was its location right in what I think is the middle of campus, basically on the campus green, so it felt like a natural gathering place. Having gone to school in Chicago, I can't imagine having a market like that literally outside my dorm. I then actually would have put on the "freshman fifteen." Also impressive at PSU was the range of cooked food vendors--not just freshly made crêpes and doughnuts but lots of sandwich options and other things. I know I took a photo of the Via Chicago stall, whose pizza my friend concluded, "looked legit." I have a lot more photos from the market, which I need to upload. I'll link here when they're ready. And there are a few meals I forgot to include upthread.